Jim Doyle introducing Colin Lewis to the club. Colin Lewis was the guest artist at Natures Way’s Fall Open House this year. He also conducted a Workshop and an evening demonstration on Friday and a Study Group on Sunday. Colin is originally from England but now lives in Maine where he has a nursery. He has written articles and books and lectured extensively. He was chosen to be one of the five judges at the Artisans Cup in Portland, Oregon. Colin shared his thoughts about the Artisans Cup: “It was not a bonsai exhibit but rather an art exhibit that had bonsai. The quality of the trees was very high, however, there were too many Rocky Mountain Junipers.” His position is that when you work deciduous trees you learn about its structure and how the tree grows, whereas working conifers whose branches are more flexible and easily shaped is more molding the tree. It is better to learn bonsai working deciduous trees since you learn more about structure”. 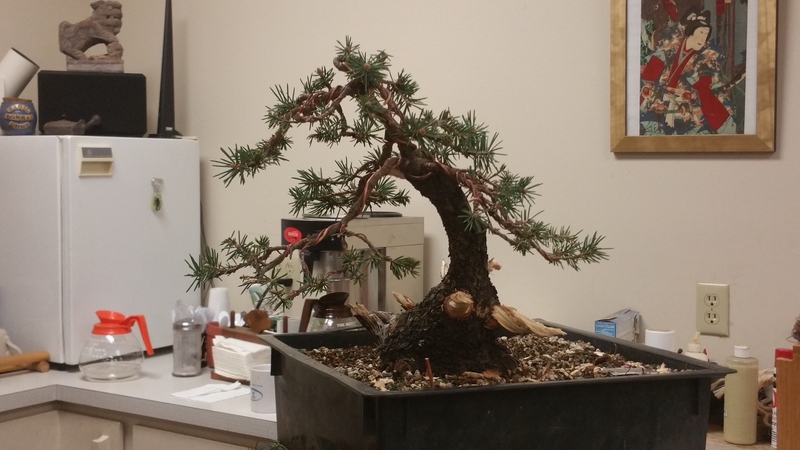 For our club demo, Colin chose to style a Colorado Blue Spruce. After deciding on the front and style of the tree, Colon began to work on creating jin. It easier to see the tree if the jin are the right color so the bark and wood are peeled off at the same time revealing a spiral grain which is common in spruce. If you use raffia on larger branches, use colored raffia for the top layer so that it is the same color as the branch being wired and bent. There is a flat saw cut at the base of the tree which will have to be hollowed out or carved. Use power tools to make a hollow. Deciduous trees have hollows instead of jin. It is acceptable to allow the hollow to rot. It is only the deadwood that will rot. The lowest, heaviest, dominant branch will be on the sloping side of the trunk. The other branches will be wired and brought lower. Spruce bleed resin profusely. This is a good time of year to work on spruce because they are not pumping as much resin. Cauterizing helps to seal the cuts so they do not bleed so much. The dry resin is white and can be removed with the use of alcohol and a soft toothbrush and then carefully wash the resin away with soap and water and the soft toothbrush. cuts down on the amount of scrap wire produced. When you want to get movement in a branch, at least three turns near the pressure points. The wires can stay on as long as they aren’t digging in, if they are digging in cut out the piece that is digging generally at the top of the tree and also the more severe bends. If you are re-wiring a tree, run the wires in the opposite direction if possible or not in the same tracks as the last time. The branches may need to be wired two or three times (small branches twice) to establish the branch shapes. Thin areas where there are too many buds. If the buds aren’t healthy, the tree isn’t healthy. Blue spruce pointy buds are not particularly vigorous but buds that look like roses or cabbage shoots will grow vigorously and extend. If you pinch in the spring, you will not get back-budding on the branch rather the branch will live for a while and buds will form at the base of the branch. The biggest task then is going over the tree and cutting out all the aborted shoots that were pinched. Colin shared his horticultural knowledge with us while wiring the tree. 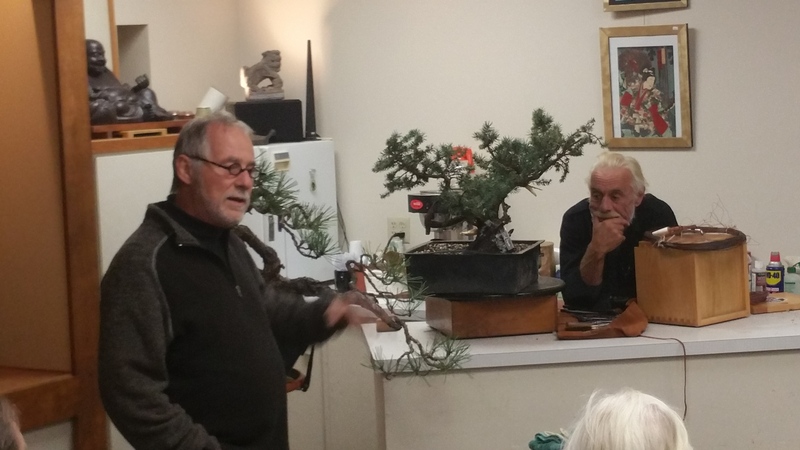 One question asked was “How did you get started in bonsai?” Colin said that during the sixties while growing a specific plant, he discovered that when you pinch the tips of branches you get two branches. This was his “aha moment” and he said “That’s how they do it!” He also talked about collecting yamadori in the White Mountains. Maine has Red Spruce which are native and are good for bonsai. Alberta spruce (Pica glauca ‘Conica’) is not good for bonsai. In a regenerated forest the birch grow first and bit by bit other species become established in the understory of the birch. When the birch die the conifers take over. When a forest fire occurs, the conifer seeds will be there and they will be growing in a far too exposed environment which favors the creation of trees exposed to extremes of wind and snow. 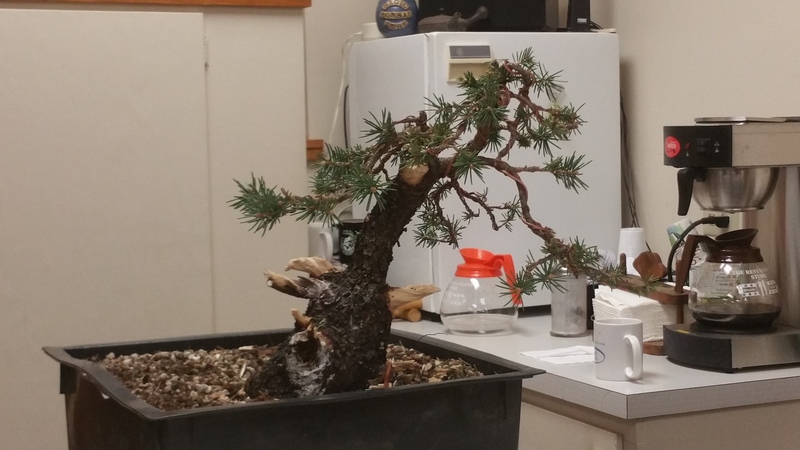 Eastern white pine can be used for bonsai but they take more time. They will back bud and the needles will reduce. The finished bonsai. What front do you prefer? 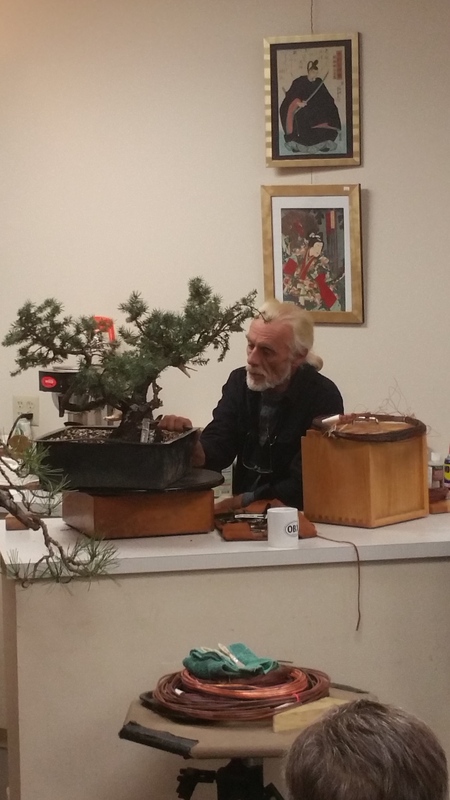 Categories: Colin Lewis, Guest Bonsai Artist | Tags: bonsai, bonsai club, bonsai demo, bonsai trees, Colin Lewis, Colin Lewis bonsai, colorado blue spruce, Pennsylvania, Susquehanna Bonsai Club | Permalink. 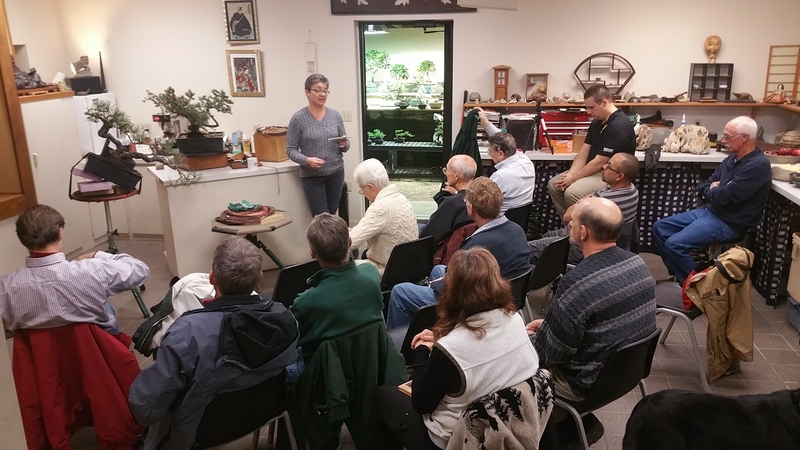 A premiere bonsai club in south-central Pennsylvania.